Marvel take their biggest risk yet with a film that is not centred on The Avengers and come out winning with this, albeit slightly confusing, spacetacular film. Thanos (Brolin) and Kree terrorist Ronan the Accuser (Pace) plan to steal ‘the orb’, one of the six Infinity Stones, in order to destroy the planet Xandar. However when Peter Quill (Pratt) steals it from under the nose of Korath (Hounsou), he engages the wrath of Ronan, and has a bounty placed on his head by his mentor, Yondu (Rooker). 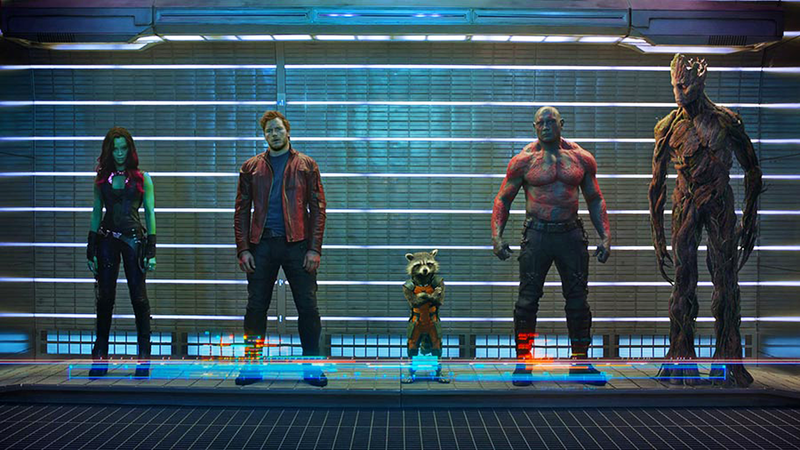 Quill enlists the help of assassin Gamora (Soldana), convict Drax (Bautista), and bounty hunters Rocket (Cooper) and Groot (Diesel) so as to sell ‘the orb’ before Ronan can ever come in contact with it. But, when the tables are turned, the anti-heroes soon have to decide which side they’d rather be on. Considering Marvel’s current portfolio of movies is focused on The Avengers, and sequels to all of the movies that merged into that universe, Guardians of The Galaxy is a refreshing break that should have the audience wanting more. The film itself is the best connection between all of the previous movies in the catalogue as it features The Other (the villain from The Avengers), Thanos (seen briefly in The Avengers as The Other’s boss), and The Collector (featured in the after credits scene in Thor: The Dark World). However this connection does lead to the potential of Groot or Rocket being on-screen with, for example, Captain America in a future movie. 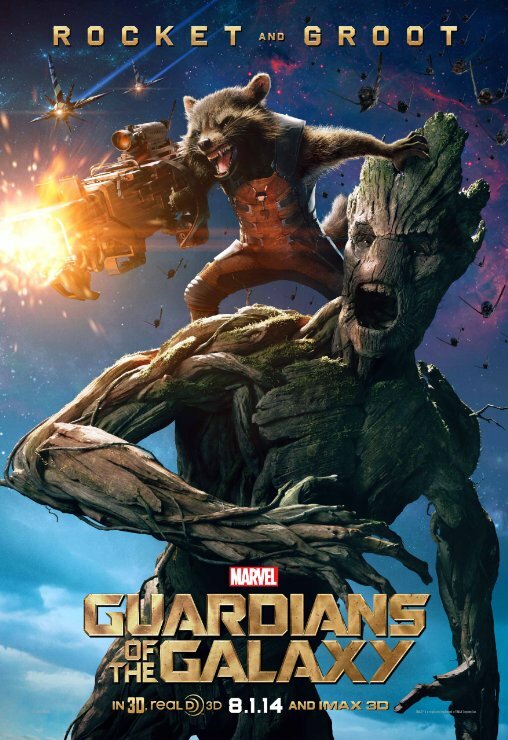 Rocket and Groot are ‘acceptable’ here as the film is entirely set in space, but having them on Earth could lead to a flop like The Green Lantern (2011). Guardian’s begins as the most depressing Marvel film of all time with Quill’s mum dying before cutting straight into the main movie. Unlike with most films that need the complex storyline explaining, Marvel decides to opt out of using a voice-over in the background to enlighten the audience. It’s only after twenty-five minutes that the characters are explained, but the entire plot is never handed over on a plate. 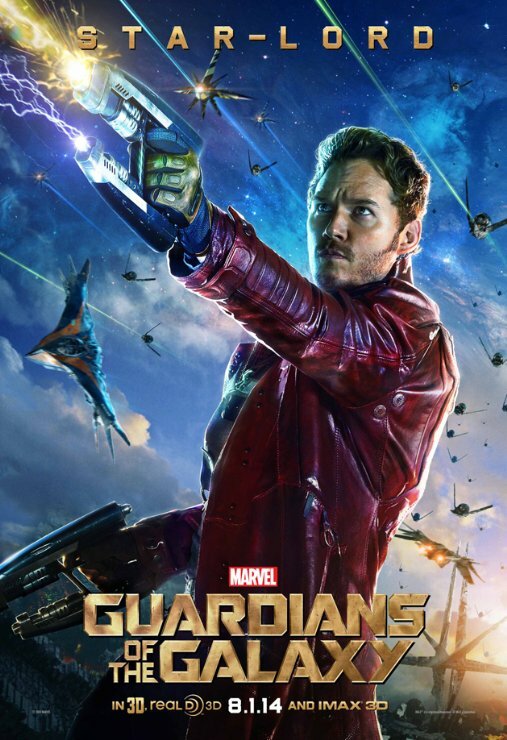 The main thing that pleases about this movie is Chris Pratt. Having given himself the name ‘Star-Lord’, Pratt seems to be a space version of Tony Stark due to his helmet of iron and constant joking about his ‘adventures’ with women. There’s something to be loved by how carefree his character seems even in the most dire of situations, abandoning the plan to fetch his walkman for example, or by dancing when surrounded by scores of enemies. It’s hilarious. However Gunn takes it too far by referencing Footloose and Kevin Bacon (more than once as well) and by having the showdown with the film’s villain as a dance-off. Funny maybe, but not the same type of humour as the rest of the film. It’s awkwardly funny. Annoyingly two of the main cast are unidentifiable. Bradley Cooper and Vin Diesel provide the voice work for Rocket and Groot respectively, but it’s impossible to tell who they are. More annoyingly is the fact that Diesel has just the three words to say in the film, “I am Groot”. Dave Bautista and Zoe Saldana can be clearly seen but, even then, having Bautista cast seems like a cop out as a muscular guy was obviously needed for the film which is probably why he was chosen for the part. That being said, he does provide a lot of laughs with his character’s literal take on sentences and this may be the funniest Marvel film to date because of that, with quips like “I wasn’t listening, I was thinking of something else” coming up every couple of lines. Even Michael Rooker as Yondu is a joy to watch as he perfectly plays the mercenary who’s both equally loveable and hateable. The two worst parts of the film occur so closely to each other that it’s painful to point up. There’s a slow-motion sequence where everyone falls in behind Star-Lord in perfect sync. This is a major blockbuster, why is this here? Then moments later, Groot manages to light up a room using some type of tree spore and orchestral music starts playing in the background. That alone should mean that this film doesn’t deserve to be the second highest-grossing film of 2014. It completely ruins the momentum that had been building up. 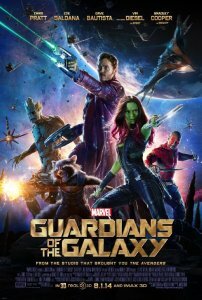 Guardians of The Galaxy makes itself a great entry to the franchise but what can’t be ignored is the useless big names in the cast. Djimon Hounsou’s Korath and Karen Gillan’s Nebula hardly receive any screen time and it seems as if the characters were included purely as another Marvel Easter Egg. Josh Brolin’s Thanos is hardly used and, unless he’s going to be the villain of the sequel (like was expected with The Avengers), it’s hard to see why he was included. Needless to say, on the other hand, seeing Stan Lee as a bachelor for his cameo is priceless and it’s worth seeing the movie just for that. What this film will do most is change people’s opinions on Chris Pratt – he has established himself as an amazing actor with this film. What will happen for the Guardian’s next? Loki may turn up since he’s Marvel’s go to villain, or the group may find themselves battling alongside The Avengers if Phase Three revolves around a fight with Thanos and The Infinity Gauntlet. It’s hard to say but one thing is for certain: these people aren’t guardians, but bounty hunters and cut-throats looking for a pay day which they well and truly deserve. Tagged 4/5, Action, Film, Review, Reviews, Sci-fi, Thriller. Bookmark the permalink.